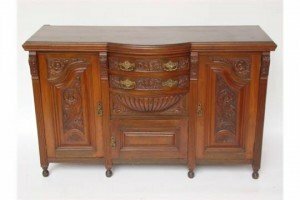 A late Victorian foliate carved walnut sideboard, with two central bow front short drawers above a small cupboard, flanked by a pair of panelled cupboard doors enclosing shelves. 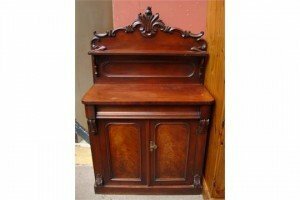 A Victorian mahogany chiffonier, the raised back with shell and foliate scroll carved crest, the base with a moulded frieze drawer over a pair of arched panelled cupboard doors on plinth. 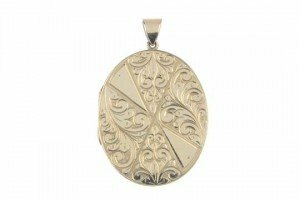 A 9ct gold locket of oval form, the front engraved in triangular panels with acanthus leaves, to the plain surmount loop. 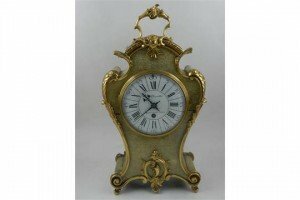 A 20th century French style mantle timepiece, the mottled cream painted case with gilt foliate mounts, having enamel dial with Roman numerals. 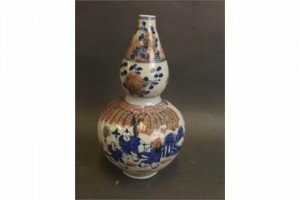 A good Chinese blue and white double gourd porcelain vase with a slender neck, painted with boys sparring in a garden, indistinctly painted mark to base. 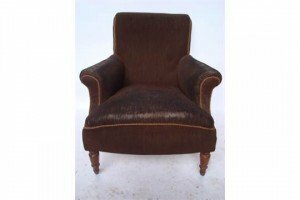 A late Victorian upholstered easy armchair, with square rollover back and scroll arms, raised on turned forelegs. 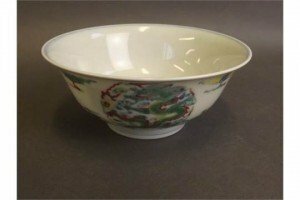 A Chinese Doucai enamel porcelain rice bowl with painted decoration of a dragon chasing the flaming pearl. 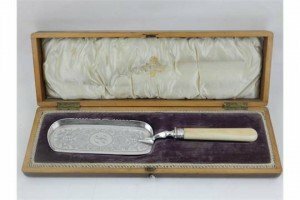 A Victorian ivory handled silver crumb scoop, contained within its original silk lined mahogany fitted case. 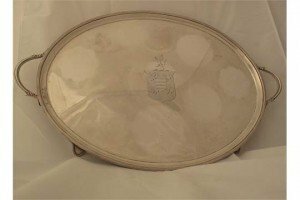 A 19th Century silver two handled tray engraved with a coat of arms, reeded border. 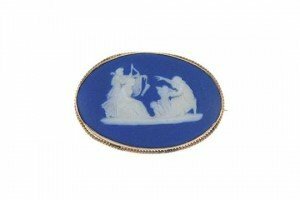 A 9ct gold cameo Wedgwood brooch, designed as an oval-shape carving depicting a lady and gentleman on a boat. 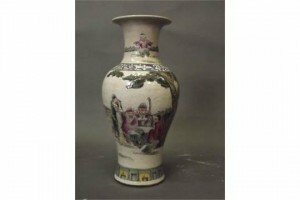 A Chinese earthenware vase with crackle glaze and enamel decoration of gentlemen playing chequers under a cypress tree. 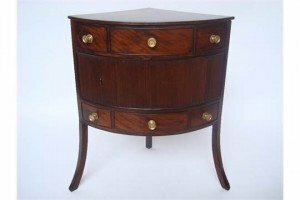 A George III mahogany corner washstand, with tambour fronted cupboard and an arrangement of dummy fronted drawers, on splayed square legs. 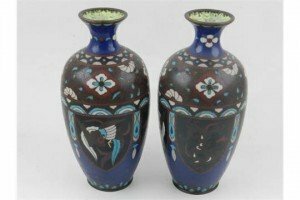 A pair of Chinese cloisonné vases, decorated with borders of stylised flowers above dragons chasing flaming pearls. 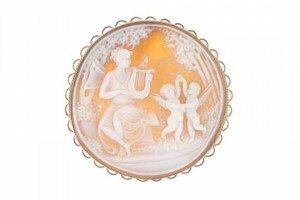 A 9ct gold cameo brooch of circular form, the cameo depicting a winged lady playing a lyre for two dancing putti, to the open scalloped surround. 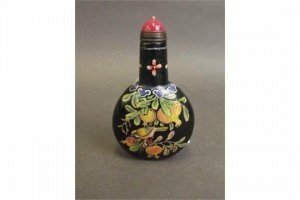 A Chinese green glass snuff bottle with painted enamel decoration of birds amongst peach and pomegranate trees. 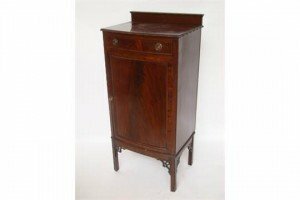 An Edwardian mahogany bow front music cabinet, with single drawer above a panelled cupboard door enclosing shelves. 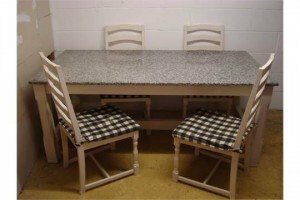 A modern white painted kitchen table with polished granite top, raised on chamfered supports united by an H stretcher together with four matching ladder back kitchen chairs with padded seats. 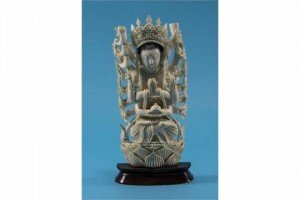 An elaborately carved standing deity in a decorative headdress with multiple arms, two arms holding a bottle with both hands, Raised on a wooden stand. 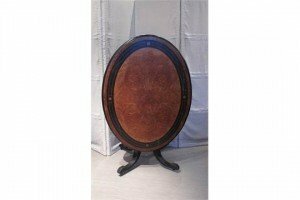 A mid Victorian walnut oval & ebonized banded centre table on turned supports and sabre feet. 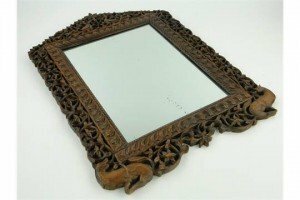 An ornate Eastern wall mirror, in carved and pierced hardwood frame with scrolled foliate and bird decoration.